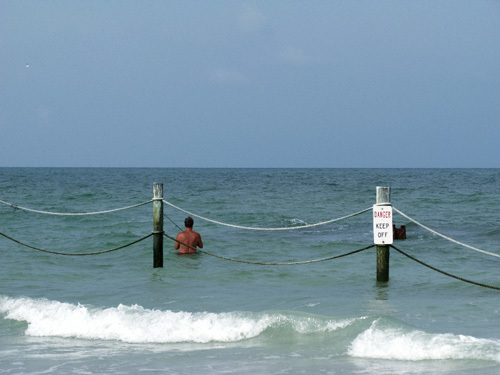 The Redington Shores Breakwater is a curious attraction on Redington Shores beach. It is the only structure like this on the Florida Gulf beaches. 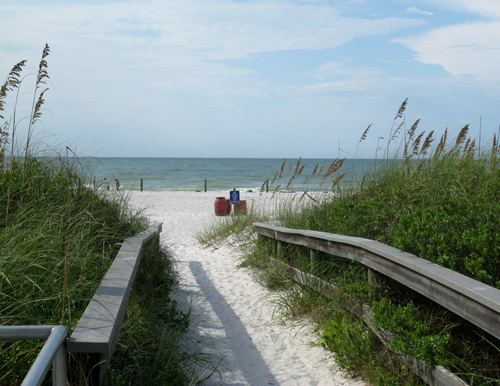 You won't be able to miss it during your Redington Beach vacation. This is a large parking lot where you are required to purchase a receipt at the pay station by the restrooms. Right now, the cost is $1.00 per hour. Built between December 1985 and January 1986, this structure has been, at times, like a lightning rod on this little one mile stretch of beach. It has been hailed as a savior of beach erosion...and it has been vilified as a $569,000 boondoggle that is both useless and an eyesore. To make matters worse, five deaths, in the first two years of the breakwater hung over it for quite awhile. 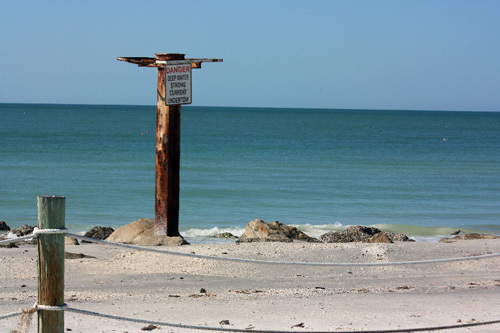 * You can read about the technical specifications of the Redington Shores Breakwater at this link. 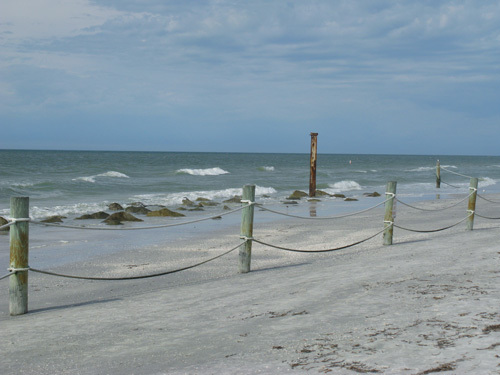 Redington Shores Beach runs for about a mile between 174th and 184th Avenues, just north of North Redington Beach. 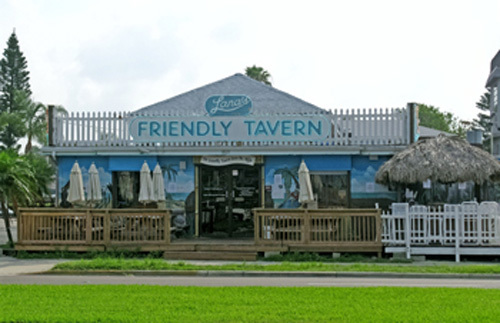 You will see Lana's Friendly Tavern on the east side of Gufle Blvd. The County Beach Access will be on the west. You'll take this walkover down to the beach. Unless you're a local, wear flip-flops because some of the beach has been renourished. 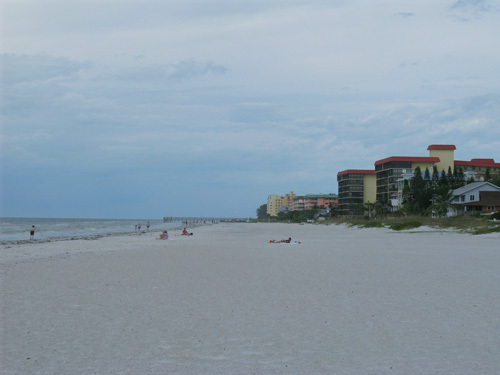 Redington Shores is a very small community of about 2500 people. Almost 70% are over 45 years old. The beach is beautiful, peaceful, and uncrowded. The breakwater is about 350 ft in length, with the first 260 running parallel to the seawall and the last 90 feet (on the south end) making a 45 degree dogleg to the south. Thick cables form a barrier to warn people to stay away. 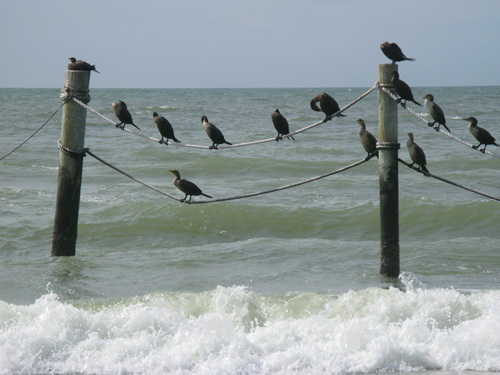 Most days, you'll find an assortment of pelicans, gulls, and terns relaxing on the cables. However...there are still idiots, who, for whatever reason (acting macho for the wife and kids???) decide they will fish right in the middle of this mess. Don't be stupid. Those rocks probably have about a million snagged and rusty fish hooks in them, and all five deaths have been attributed to being slammed into those big rocks. Think about it, if you get knocked off your feet by the strong currents, which of the retirees tanning on the beach are going to fling themselves in there to rescue you? The best thing you can do at the Redington Shores Breakwater is to take some pictures and send them back to your friends.